Everybody likes to use, test and hack with the mini distros, but no one likes to burn a CD for each one because they only takes a small fraction of the CD space resulting in low resource utilization and increases junk. What if we could keep all the distros in one single CD or even keep all the distros in one USB drive and boot the distros directly from there through an interactive menu system ? Yes that’s what we are going to do! We are going to pack 7 mini distros into one CD/DVD or USB ready-to-boot, and can carry them around in our pocket, booting any distro, anywhere, anytime, any place. So don’t wait, get the job done. Keep on reading. The whole process is divided into 7 Phases. Each Phase is again divided into some numbered sections. Follow Phase – I to Phase – IV , then to make a liveCD follow Phase – V or to make liveUSB follow Phase – VI, then continue serially. At all time keep two terminals open, one as normal user, and another with super user privilege, in both of the terminals always remain fixed inside a working directory, the “work_dir”. We will either point directories/files relative to “work_dir” or in absolute path. If some source packages are needed to be compiled, launch a new terminal in the source directory, carry on the compilation and terminate it. When you see the ‘#‘ symbol beside a command, switch to the root console and execute, and when you see ‘$‘ run it in normal user terminal. If there is not enough permission when trying to modifying/removing some file then ‘chmod’ it with proper permission first. Warning: Always be extra careful when executing commands in super user mode. Double check which device are you operating on when setting boot flags, bootloaders. Else you might render your system un-bootable. Create the “work_dir” directory where we will dump all the resources. Create “mbcd” and “boot” directories in chains inside “work_dir”. The “mbcd” will be used to hold the compiled image files and the boot will the directory containing the boot files for the image. Then change directory to “word_dir” and be sure to be fixed in this location. $ wget -c  " link_of_os "
Where “/path_to_os/” is the absolute path to the downloaded distros “.” is current directory. Check the Links section for the official sites of the distros. We will now mount the ISO images in the mount point directories. Keep track which OS is mounted in which directory. You can name the directories accordingly, such that you can identify from the name. But for simplicity we will name them as “tmpX” s. Austrumi, Puppy Linux, Slitaz, CDlinux, DSL, GeeXboX, and GoblinX (Micro) will be mounter into “tmp1”, “tmp2”, “tmp3”, “tmp4”, “tmp5”, “tmp6” and “tmp7” respectively. We will set the owner and group of the mounted images to your normal user account and it’s group, by specifying the ‘uid‘ and ‘gid‘ options. Run as normal user ‘ id -u ‘ and ‘ id -g ‘ for the user and group id respectively and note them down. Replace <id> and <group>in the below commands with your user id and the group id respectively. Generally if you have only one user it the uid and gid both should be 500. Note: If you decide to mount the images as root as owner (without uid, gid options) then do the copy operations as root, as some of the files have forbidden access to all the users but the owner. After you have done all the copying you can ‘chown’ the copied files to normal user. or keep it as it is. Shortcut: You can skip the step 3 and 4 of this Phase, if you plan to use isomaster or file-roller and extract the needed files in the next phases with it. Now we will copy the OS files from mount points to proper location in our image directory. First let us understand the requirements briefly while copying the files. Each OS has a kernel, and an initial ramdisk file where the kernel is decompressed and gets loaded into RAM. Then it loads the needed files mounts the OS file system and run programs to setup the OS. The kernel and the initial ramdisk files are loaded through the bootloader from the media. There is a filesystem for each OS where all the programs, scripts, configurations are installed. In the mini distros these are generally compressed, and/or encapsulated in a file system. Like CDlinux and PuppyLinux uses squashfs, etc. There may be more than one such filesystems for an OS, each containing needed files for a certain application software. For example, additional squashfs module can be downloaded for openoffice, or java runtime in puppylinux. Some distros finds the compressed filesystems in a certain location relative to the root of the bootable media, for some distros the locations of the files can be altered, but the changed location should informed by passing an appropriate boot parameter when booting, and some distros searches their files in all the attached disks of the system automatically. To know the requirements of a certain OS you should read the documentations in the official site, discuss in fourms, or the distro’s IRC channel. Or if you know some shell script, mount the initial ramdisk of the distro and read the loading script. After copying the OS files make sure the copied files are accessible to the distros, and the different OS files doesn’t create conflict. Some relocation will be done to avoid conflicts else we will try to keep the copying clean with minimum relocation. Some files might have read-only permission to the owner, in such case ‘ chmod u+w ‘ should be done before modifying, deleting, overwriting it. Copy “bzImage” and “initrd.gz” from “/mnt/tmp1/isolinux” to “mbcd/boot/austrumi”. Austrumi searches for it’s files in the boot directory, so you need to keep it in there. From version Austrumi 1.8.x the kernel and the initial ramdisk files are located in “austrumi/” directory in the image. You can download and add additional puppy .sfs modules and keep them here. Now draw the attention to “/mnt/tmp3” , the slitaz mount point. Copy “bzImage”, “rootfs.gz” from “/mnt/tmp3/boot” to “mbcd/boot/slitaz” and copy “vmlinuz->version_no<-slitaz” to “mbcd/boot”. Then make a directory “CDlinux” inside “mbcd” and copy the directories “extra” and “settings” into it. Copy then “lang” directory into “CDlinux/” if they are needed. When writing the config file in Phase – IV you can pass your language as the kernel parameter. CDlinux allows you to place customized packages inside the “CDlinux/local” which gets automatically detected when booting, use it if needed. Now time for DSL, mounted on “/mnt/tmp5”. Copy “linux24” and “minirt24.gz” files from “/mnt/tmp5/boot/isolinux” to “mbcd/boot/dsl”. Copy “vmlinuz”, “initrd.gz” and the “splash.png” file from “/mnt/tmp6/GEEXBOX/boot” into “mbcd/boot/geexbox”. Copy “vmlinux” and “initrd.gz” of GoblinX from “/mnt/tmp7/boot” into “mbcd/boot/goblinx”. Then copy the “/mnt/tmp7/goblinx” directory into “mbcd/”. Note: GoblinX is now have become ImagineOS (site: http://www.imagineos.com.br/) . GoblinX mini (and others) could be still found in the internet. Try This link . This subsection is kept intact. That ends the copying of files for the seven oses. Now we will install the boot files which are needed to make the ISO file or the USB bootable. We can use either the GRUB bootloader or the SYSLINUX bootloader. Installation of both GRUB and SYSLINUX are described. In Phase – V we will either use GRUB or SYSLINUX to make the CD ISO image bootable. (though both the bootloader files can recide in the image without conflicts). To boot from CD GRUB needs a special image for loading the stage two. You need the ‘stage2_eltorito’ file. If you have got GRUB installed in your system then execute any one of below commands and note the path. Else download the GRUB source, compile it and get the eltorito image. To install the syslinux two files are needed, the “isolinux.bin” needed to make the image bootable, and the “vesamenu.c32” needed to enable graphical menu system. If you do not want the graphical menu system then you can omit “vesamenu.c32” . Or download the source from syslinux official site, extract and “make” it, but don’t install (if you want to avoid installation), ie. only execute ‘./configure && make’ . Get the needed files from the source directory. Shortcut: To avoid downloading and compiling syslinux or grub, just copy the “isolinux.bin” and “vesamenu.c32” for syslinux and “stage2_eltorito” file from any of the distro’s boot directory and continue to the next step. The previous phase sets the boot-loader files, now we need to tell the boot-loader which OS to boot. We also need a menu from where the user can select an OS to boot; we need a configuration file. Syntax differ in GRUB and SYSLINUX. To know about config file syntax use the man pages. Say ‘info syslinux‘ and ‘info grub‘ . Some Oses need different boot parameters to be passed for USB and CD versions. We will present the configuration files for the liveCD version in section 1 (GRUB) and 2 (ISOLINUX) below, after that in section 3 we will describe the modifications needed to the liveUSB version. The above command transforms the image into 640×480 size, 14 colors xpm, compress it in a gzip file “splash.xpm.gz”, which grub can display. Move this into “mbcd/boot/grub” . The ‘convert’ program is a component of ImageMagick. If you don’t have it, install it first from your distro’s repository or from source. Shortcut: Download ready-made GRUB loadable format image from internet. In the configuration file add the below line to load it. Now we present the boot configuration file for GRUB. Go through it and check how the paths are changed. Just make sure that each absolute path within the CD (considering mbcd directory is the root) are valid and points to the correct kernel and ramdisk file. Now copy the .jpg image with 640×480 size, say ‘splash.jpg’, into “mbcd/boot/isolinux” directory. SYSLINUX can load .jpg images directly without any modification (with “vesamenu.c32” module). If you decided to not include “vesamenu.c32” module then you can always have text menu. Without “vesamenu.c32”, the ‘MENU’ keywords won’t be recognized and no graphical menu will be displayed. It will show an error and fallback to text mode showing prompt “boot:” asking for an OS label. Just enter the label of the OS (beside the “LABEL” field) which you want to boot and press enter. To avoid memorizing the LABEL names, write a plain text file containing the OS name list and their corresponding label names and save it inside “mbcd/boot/isolinux” as “list.msg”. It is printed on screen at boot time by “DISPLAY list.msg”. The line “F1 list.msg” displays the “list.msg” file whenever you press F1. In Phase – VI we will describe how to make a bootable liveUSB with SYSLINUX and GRUB. If you are making a multiboot liveUSB only then make the following changes to the configuration file (GRUB or SYSLINUX). For Puppy replace ‘pmedia=cd’ with ‘pmedia=usbflash’. For DSL append ‘fromhd’ boot parameter in the kernel line. For ease, the configuration files contains the changed liveUSB lines (commented). Just comment the line for liveCD and un-comment the line for liveUSB to achieve the change. Recheck the “mbcd/” for errors, check if all the path to the configuration files are valid check if all the files are copied, remove unnecessary files. (like backup files ending with tilde “~”). We will use mkisofs to make the iso image. Run the below command if you are making a GRUB bootable image. If you want to make the ISO image to boot with ISOLINUX then you need point to the “isolinux.bin” boot image. Now burn it into a CD-R with your favorite burner. Burning into a CD-RW will enable you to re-burn updated images. Burn the CD as multi-session disk. To do this in k3b, click Tools->Burn CD Image select the image to burn, click the ‘Advanced’ tab and check the ‘Start multisession CD’ box. Thus the distros which support saving sessions in the CDs can use the remaining space to save the sessions too. If you have added more distros and stuffs that goes beyond a CD capacity, then burn it in a DVD-R or DVD-RW. Tip: Test the iso file in virtual machine before you burn. Now we will convert your USB flash drive in a GNU+Linux powered home made Swiss knife with 7 flavors. We will describe how to make your USB drive bootable with both SYSLINUX and GRUB. Though this process is not destructive, still backup all of your data is always recommended (See “Notes on USB Booting”). First copy all the contents of “work_dir/mbcd/” into the USB drive partition. Then install GRUB or SYSLINUX bootloader and set the boot flag, as described below. This will alter the MBR by installing the boot code and installs ‘ldlinux.sys’ in the partition. The shell script ‘grub-install ‘ will be used to do this job. The below command installs GRUB in both MBR and te partition. The directory “/media/disk” should point to the mount point of your USB partition. This will install the boot code in MBR and install the stage1.5 and stage2 into the partition and set the configuration file. If it tells that “dev/sdX does not have any corresponding BIOS drive.” then the usb drive is not yet mapped by grub in the device.map file. To map it either use the --recheck flag with the above command or create a file inside boot/grub of your usb drive and then re-execute gurb-install . Read this post Installing GRUB Bootloader to get a better description. Enter ‘p‘ in the ‘fdisk‘ prompt. If you see “*” beside the disk partition under the boot column then the partition is already bootable, simply enter ‘q‘ to quit. Else to make it bootable: Enter ‘a‘ then, when asked, enter the partition number and press enter (if your drive’s partition is /dev/sdb1 then enter ‘1‘ as the partition number). Enter ‘p‘ again to check and then ‘w‘ to write the changes. After you have installed either GRUB or SYSLINUX make the changes in the configuration file as described in Phase – IV section . Now we will cleanup the mess we created. Notice that the working directory has grown to a huge size, because you have three copies of each OS in it (the original ISO, the extracted files, files inside the mbcd.iso) . We will dispose the “work_dir” excluding the “mbcd.iso” (obviously). Move the “mbcd.iso” one depth up the directory tree, get out of “word_dir” (for the first time) and remove it. Then unmount all the mounted iso images, remove the mountpoint directories. To add, modify or change mbcd image you don’t need to mount all those distros again, just extract “mbcd.iso”, make edits, and repack it to an ISO, or use ISOmaster. Congratulations you have just rainbow colored your USB drive and CD ! All knoppix based live distros has a compressed file system, the cloop file in the same location and same name “KNOPPIX/KNOPPIX”. So no more than 1 knoppix based distro can reside in a media. To keep more than one knoppix based distro in a media, the cloop files of the different distros should be kept in different directories or with different name. After you change the cloop file’s path you need to pass it with the boot parameters shown below. For example we have kept the dsl cloop file in “dsl/” directory, so we have passed ‘knoppix_dir=dsl/’. If the name of the cloop file is changed then you also need to append “knoppix_name=newname” as the kernel parameter. An example for GRUB is shown below. Only changing directories are recommended. To boot from a USB drive you need to plug it in and make sure that your mother board will boot first from that drive. Consult your mother board manual to change boot order. If still it does not boot then check if your motherboard supports booting from USB. Similarly to boot from a CD you need to make your system to boot from the CD drive first. About Eltorito: El Torito is a specification that says how a CD-ROM should be structured so it can be booted directly. It works by making the CD drive appear to be a normal floppy drive. Thus a bootable floppy image is put in any location inside the CD-ROM file hierarchy and a pointer to that location is placed in the CD ISO header, which is used by the BIOS to load the image from the location in the CD and then works as if it was booted from a floppy drive. When we burn the image we point the location of the bootable floppy image that is the ‘stage2_eltorito’ with the ‘-b’ flag, and then the location pointer of the image is then stored in the header. About MBR: The Master Boot Record or the boot sector consists of 512bytes and it resides at the beginning of the disk the first sector. The first 446 bytes is reserved for the boot code. The boot code needs to be installed in order to make the BIOS boot from this drive. The next 64bytes contains the partition table. Each partition is described with 16 bytes, so the disk can contains 4 primary partitions. The last to bytes contains the signature. The ‘syslinux’ command installs the boot code into the drive, but for one case in a compaq system it failed to boot from the USB drive. Installing the boot code manually resolved this problem as described below. A multi booting media is always popular, especially when it has a collection of great mini distros. Now when we have booted a CD/DVD and a USB drive why not we do the same with an internal HDD. This can be done exactly as we did for the USB drive. Keep the OS files in the root of a drive and make sure all the locations are correct in the config file, then make the HDD bootable with GRUB or SYSLINUX, and load the configfile for menu, and if GRUB or syslinux is already installed then it is already done you just need to call the configuration file with configfile command from grub shell. Nothing more i will say about this and i will leave this to you to work out and make a multibooting single partition HDD. Note: Please play safe, because sometimes you only come to know about the loss when you restart the system the next morning and stand shocked in front of your system. I am linking to the archive file containing all the used configuration files and image files used in this process. 13.04.2011 : Minor restructure and typo fix. I have never tried booting from an ISO image with GRUB4DOS , i think you should have a try. This guide was made to compile all the mini distros. I cannot tell anything about XP or any windows stuff, but the slax, mint or others can be done easily, what you have to do is just see how the files are located in the original LiveCD , or else as i have told in the article, check the docs, kernel parameters, forums, and if possible see the loading script, and you will come to know what are the exact needs of that distro and what you have to do is to configure your multiboot media in that format. Once you understand one format it is almost the same for others. And for the password crackers, CDlinux has got the Offline NT Password and Registry editor, the chntpw program, you can reset passwords with that too. Let me know if you are able to compile the above stuffs. Nice post..Keep them coming :) Thanks for sharing. thank you for this nice How-to. 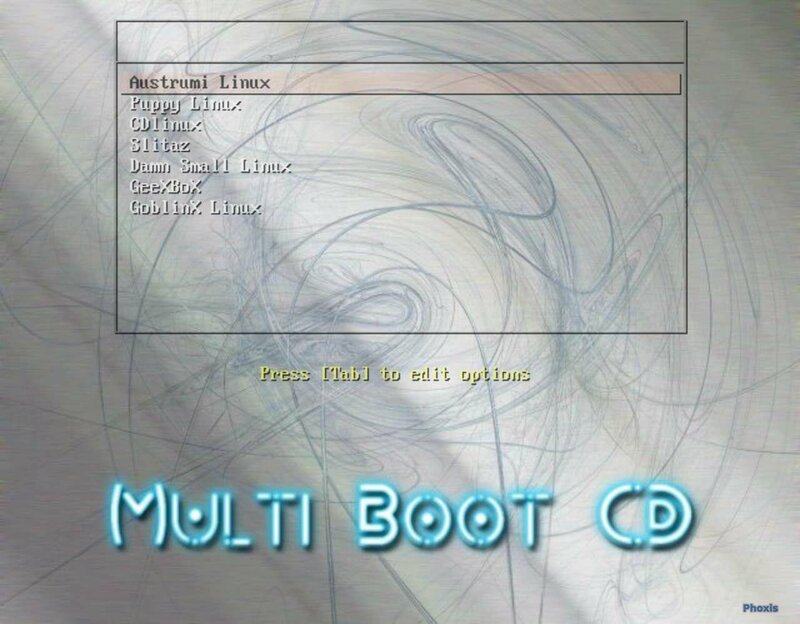 I thought about combining multiple small live cds in one usb live system with a nice menu etc for quite some now, especially since i have a new Subnetbook with no optical drive. Because i use tools like gparted, clonezilla, Super Grub disc etc. quite frequently, all of them around 100-150Mb and even less, i hoped to achieve this following your nice guide. Unfortunately i had no luck, neither the grub nor the syslinux way. And although i created a decent syslinux.cfg with the correct path information and used the adviced steps in Phase VI i can’t make it work. I can see and use my created menu, but all boot attempts get stuck when it comes to probing for the hdd’s long after the kernel images have been loaded. All individual live usb images are working. Do you have an idea what might be causing this? Are you trying to boot the LiveCD ISO images itself ? Then they will not work like this. Or else if you have extracted the kernels and the initrds in the proper location, then are the other files in the correct position so that the LiveCD’s scripts could find then in place. Chek Phase – II . When creating syslinux.cfg you entered correct paths, but did you include proper kernel parameters which they need? They could be found in the configuration files of the LiveCDs, check them for which image’s kernel need which parameter. If you change the location of the other files of a certain LiveCD relative to the root of the USB, then you might need to pass the new changed location as a kernel parameter in order to make the scripts find them. I would suggest you to first download some mini distro ISOs, and try putting them in your USB drive on by one. Extract one mini disttro put it in the proper places as the guide describes, and check if it works. Then try another. This will make sure things are going fine at your end. For the grub matter, it does not have the bios drive mapped to your usb device. You can do it manually. First make a file “myusb” (without quotes) inside the root of your USB drive. I assume the path of this file is /mnt/disk/myusb , change as needed. I have updated the post with these information. Please let me know if this helps, and what exactly the problem you are facing. Thanks for the great feedback.